The main focus of the 2011 General Assembly was on the State’s finances, just as it has been for the last three years. A family can postpone paying for things they want or need by charging them on a credit card, but eventually the day comes when they have to start living within their means. The State is no different and the day is here when the State must start living within its means. Everyone is going to have to bear part of the means. The state income tax rates were raised on all income earned in 2011, but the withholding for this began August 1. The amount withheld from everyone’s income will have to be more to cover the increased taxes they will have to pay next spring. The maximum deduction for local real estate and personal property taxes has been reduced from $500 to $300 which means that everyone who was taking the maximum reduction will have to pay at least $200 more in state income tax. The general sales tax was increased from 6% to 6.35% and many things that used to be tax exempt are now taxable. Among the items now taxed are clothing and shoes costing less than $50, over the counter medicines and fabric and other supplies for making clothes at home. The Department of Agriculture came through the financial problems in good shape compared to many other state departments and agencies. The General Assembly authorized $10 million in new bond funds for farmland preservation. This, plus the money from the Community Investment Act, will allow the Department of Agriculture to maintain its farmland preservation program at its current pace for the next two years. Funds are also available to subsidize dairy farmers when their cost of production is more than they receive for their milk. Until this year any farmer who wanted to sell his products at farmers markets in more than one health district had to pay for an inspection and obtain a permit in each health district where he wanted to participate in a farmers market. Public Act 11-191 provides that an inspection and permit from any health district is good throughout the state. The so-called “ten mil” program which postponed most of the local property taxes on farm land before the “490” program existed is scheduled to phase out in 2012. Public Act 11-198 will allow the owners of land under the ten mil program to transfer it into the 490 program without having to pay the postponed taxes on their land and the timber on their land. Without this act many land owners would have been forced to sell some or all of their land to pay the taxes when the ten mil program expires next year. Governor Malloy has just announced that the animal rescue program operated by the Department of Agriculture will have to be abandoned because of the budget crunch. Under this program farm animals that were neglected or uncared for could be seized by the Department of Agriculture. The animals were moved to one of the prisons where the inmates nursed and cared for the animals until they were healthy. The animals were then sold at auction to recover the cost of their care. While it may seem cruel that the State could seize a farmer’s livestock, there were several cases in recent years where the animals were starving because the farmer could no longer afford to buy any feed. 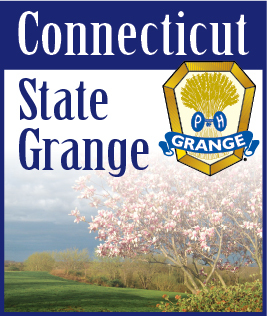 The Grange supported a bill that would have transferred regulation of outdoor wood burning furnaces from local control to the State. The Environment Committee supported this bill, but the Senate did not act on it before it adjourned. The net result is that towns can still pass any ordinance they want concerning the use of outdoor wood burning furnaces. In several towns all such furnaces have been banned because some people did not know how to use them properly to avoid polluting the air. Some vegetable farmers now sell shares of their crop to people who want to have fresh local produce all summer. Those who purchase the shares go to the farm each week and pick up their share of whatever crop is ready for harvest. A bill was introduced that would have allowed dairy farmers to sell shares of their milk production and the shareholders would go to the farm each week to pick up their milk. This was primarily of interest to those who prefer raw milk to pasteurized milk. This bill was not approved by the Environment Committee and so it never reached the floor for debate. The former Public Utilities Control Commission was merged with the former Department of Environmental Protection into a new Department of Energy and Environmental Protection primarily so utility companies will not have to go through two sets of applications and hearings for the same projects. A bill to move the park, forest, fisheries and wildlife sections of the former DEP into the Department of Agriculture was not approved by the Environment Committee. Several people from various organizations including the Grange asked me about two bills that at first glance seemed to create many regulations concerning bingo, raffles and similar games of chance. All that these bills did was merge the Commission on Special Revenue into the Department of Consumer Protection, but each bill was over 250 pages long because of the many references in the general statutes to the Commission on Special Revenue that all had to be changed to the Department of Consumer Protection. The only change for anyone applying for a license or permit is the name on the forms.